A basic shampoo-conditioner routine never seems enough to keep my dry, frizz-prone hair looking healthy. I am always trying out deep conditioners and oil treatments, and the latest products I have added to my haircare routine are the Giovanni 2Chic Pineapple + Ginger Intensitve Hair Mask and the Anti-Frizz serum from the same range. This range uses a dual nutrient complex with pineapple and ginger extracts that provide a cocktail of vitamins (vitamin B, C, and E ) along with zinc, working to fight damage, minimize frizz, and add health and shine to the hair. These products also have a sweet, tropical scent which I love. Scroll on for more. 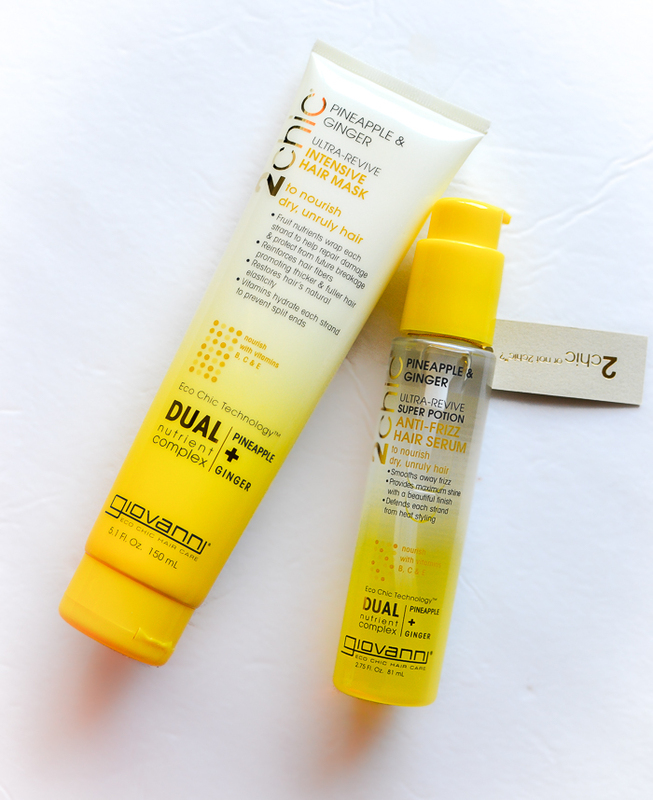 Giovanni 2Chic Ultra-Review Pineapple + Ginger Intensive Hair Mask is a deep conditioning mask that is to be used after shampooing. Apply generous amounts from roots to ends and leave on for about 5 minutes. The product is easy to wash off and leaves my hair noticeably softer. It adds moisture to the hair but doesn't leave it slippery like a lot of conditioners, which means lesser product buildup. I use the Anti-Frizz serum on slightly damp hair and either air dry or follow with my usual styling routine. It does add some protection against heat damage, but I do use a heat protectant if I blow dry or use a flat iron. As with the mask, I can feel the serum adding a softening effect to my hair without weighing hair down or making it look greasy/oily. The pesky ever-present flyaway hair is also much less obvious. 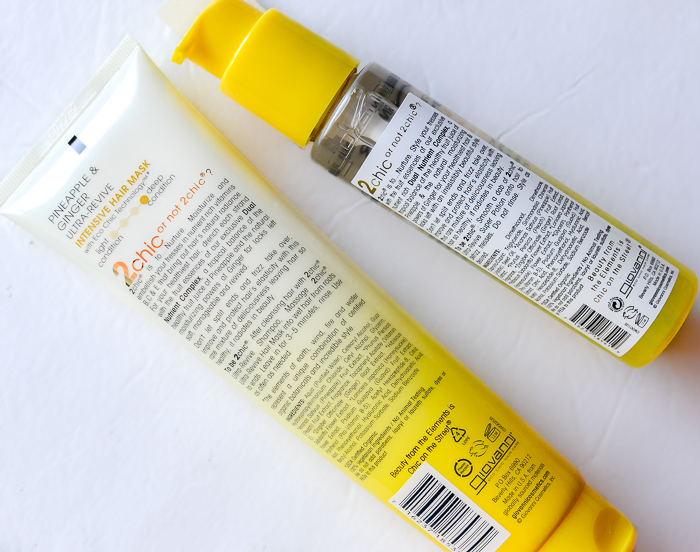 Both products have been great at adding some moisture to my dry hair without leaving it looking too limp or weighed down. Do give the Giovanni Ultra-Revive Pineapple + Ginger range a try if you have dry, frizz-prone hair. I usually pick up Giovanni products from my local WholeFoods, but you can also order directly from giovannicosmetics.com (where you can also find a list of retail locations that carry these products).